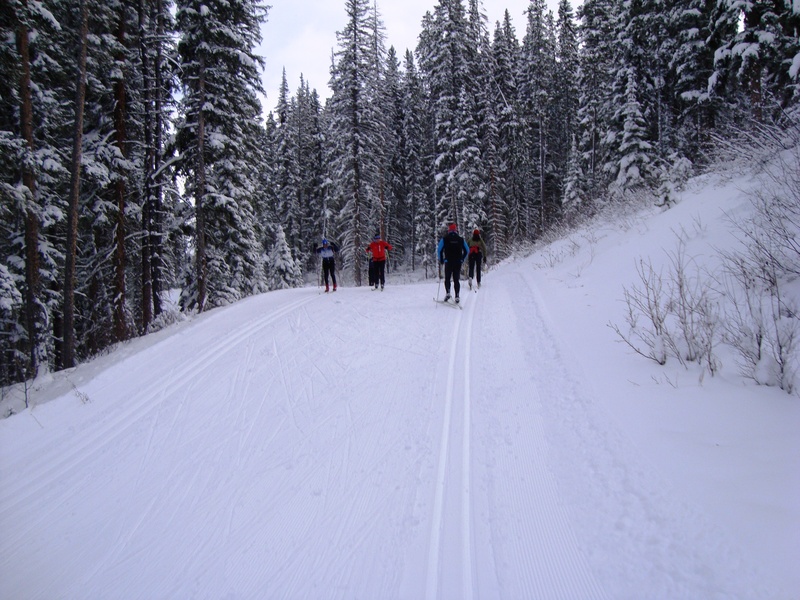 I cruised around the Canmore Nordic Centre Monday evening on surprisingly good conditions. The tracks are rocket-ship fast, but I was able to get good grip with Swix violet. It was much better than what I was expecting to find. The skating lane looked excellent. In the few places where the tracks were icy, I simply stepped into the skating lane to get grip. There was no tree debris in the tracks. I didn’t take my camera, so I’ve posted a file photo which is exactly what it looks like today. I skied on Banff Trail, Bow, Grey Wolf, Meadowview, Silvertip, Bruin, Roller Coaster, King of Sweden, and Olympic. Did all that in 75 minutes. I told you it was fast. Some of the secondary trails are actually in better shape than the main trails, as they are narrower and protected from the sun by trees. Hi Bob. Here is a report for PLPP from Tuesday April 19. The Tuesday seniors group bus (+55? ski, snowshoe or hike?soccalgary@calgary.net/club ) dropped a bunch of us at the Elk Pass parking lot at 10 am. New for me, waxless skis propelled me up the -9C snow. The track was a wall worn trail with a dusting of new snow. The gentle ascent was easy with the skis and I took the Bolton Creek trail where again the track had been skied on lightly and the skis moved easily. Fox Creek to Moraine with similar conditions and the skis proved their worth by making the undulating trail easy with Ferarri liked prowess. Arriving at Whiskey Jack and across the road to Wheeler, the short-comings of the waxless ski came to light on the newly set track. The hard walls of ther set track echo the noise of the skis tread reminiscent of the zig-zag snow tires of old. Long flat stretches were painful and glide was finite although the kick was always there and herring boneing was never needed.Amos was untracked and remained the same across the road and all the way to William Watson Lodge where I arrived at noon. After lunch and 3 fine WWL coffees at the lodge (access, a club perk) I was ready to go at 1:00 pm. The sun was at its warmest and the dry granular snow of morn had gave way to a sugary whipped cream texture. Here were the ideal conditions for the waxless skis. Skiing Braille was not an option as no one had skied it before and as its direction was uncertain, I opted to ski up to Lodgepole where it was broken and the meandering trail was fun with the sure kick of the skis. Sinclair meets Meadow and it was down the hill to the road and to Pocaterra and its lodge. Forty-five minutes and probably my best ski in these types of conditions. Hi Bob, the Seniors Outdoor Club enjoyed fabulous track skiing Tuesday. It was -10C as we set off from Elk Pass parking, and we had blue wax conditions all day, good glide and quick tracks. We skied from Elk Pass parking to Fox Creek (superb) and on up to Blueberry Junction, then Blueberry Hill, again just great conditions. From there up to Elk Pass, Hydroline, Patterson, Fox Creek and Moraine. So fun!! It was cool enough that the sun did not affect the snow quality until about 2 pm. A BIG “thank you” to the track-setter for the wonderful job he has done this whole season. He obviously takes pride in doing a good job, and has provided so many of us with so much skiing pleasure.